When it comes to most popular distortion pedals for metal, there is one model that’s known around the world. We are, of course talking about the one and only Boss Metal Zone MT-2. It is the quintessential gain box, loved and hated by many. Lets check it out up close. Boss is one of those brands that is pretty set in their ways. While that doesn’t generally apply to their circuitry, it definitely applies to their pedal chassis design. Boss MT-2 features that same body that we have seen so many times by now. The ultimate stomp pedal capable of taking impressive amounts of abuse. Lets be honest here, it is not the prettiest sight in the world, but that is not what Boss is all about. Since they color code allof their gear, MT-2 is one of the most recognizable pedals on the market. It features a sleek black finish with bright orange labels and markings. You just can’t miss it. In terms of keeping it juiced up, you are left with the standard choices. A 9V battery works great, as well as a DC adapter. Overall, it is an average Boss package on the outside. Due to chassis limitations, Boss is sometimes forced to be creative when it comes to controls. Metal Zone is by far one of the best examples of this creativity. They needed to pack six knobs in the control cluster with a very limited amount of space. Naturally, the solution Boss went with are two dual function knobs. Going from left to right we see a Level knob followed by a High/Low knob. Next comes your Mid section that includes both a Mid control and Mid Frequency control. Lastly, we have the gain knob that is labeled Dist. From a practical point of view, these knobs are great to use in relaxed environment, but could turn into a real pain if you have to make adjustments on stage. With that said, the most common practice is to find your settings before hand, so this whole thing becomes a non-issue. 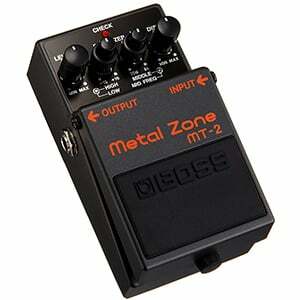 Metal Zone MT-2 is an iconic distortion box and that’s something no one can really take away from it. With that said, it still requires some finesse if you want to nail a great tone. Otherwise, you can fall victim to a tasty setting that doesn’t cut through the mix. 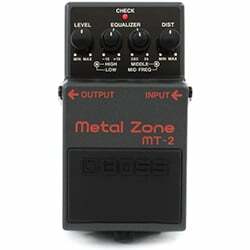 For more info about the Boss Metal Zone MT-2, click here. 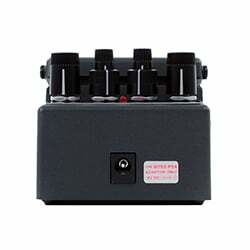 For more Best Distortion Pedals For Metal you might like, click here.